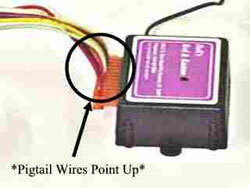 Begin the Coding Process by disconnecting the orange pigtail from the receiver. Wait 10 seconds, and reconnect the pigtail. The red LED will come on. Within 7 seconds, press the code button. This will cause the red LED indicator to go out. This is the only time in the coding process that you will press the code button. Immediately pick up a transmitter and HOLD DOWN the green button. This will cause the transmitter indicator to light up green. The red and yellow buttons will be coded through the green button.